Something that has been planned and worked on for over a decade has been realized. The University of Ottawa Heart Institute Invites you to see the next generation Heart Institute! 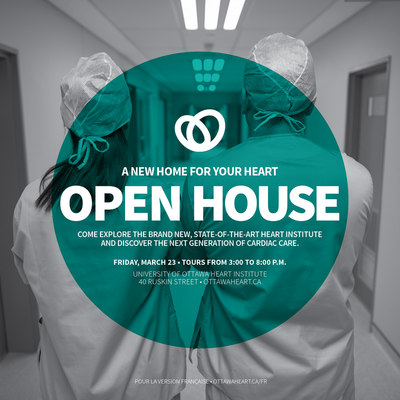 Come Explore the Brand New State-of-the-Art Heart Institute and Discover the Next Generation of Cardiac Care. Friday, March 23 - Tours From 3:00 to 8:00 p.m. The end of construction on the Life Support Tower is drawing to a close - with official handover from PCL expected on March 10. 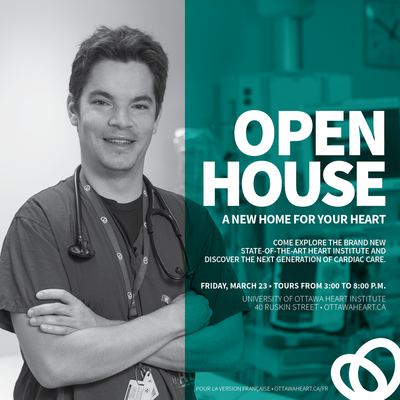 This is a significant milestone in the UOHI project and they are excited to open their doors on March 23rd to the public to show off this wonderful new facility (see invitation to community above!). Construction will start in the main lobby of the Institute and at the front entrance March 12. This will mean many disruptions as construction starts on our new front entrance and will continue for about a year or more in various phases. Inside the lobby, the Tim Horton's kiosk will be moving into the cafeteria and operate on a smaller scale. Remodeling of the volunteer desk, washrooms and family waiting rooms will get underway and be completed by the this summer. Significant work will start on the exterior as we push the lobby out to the sidewalk to create better waiting areas for families and visitors, a new volunteer desk and to reposition the front door. The trees that border Ruskin, west of existing entrance only, will be removed to allow for this expansion. Considerable new landscaping will be introduced as part of the new front entrance including to the east of the current entrance. The ambulance entrance on the south side of the building will reopen so that ambulances will move off Melrose to unload. This should happen by the end of July. The new circular entrance and exit for people going to proximate TOH buildings will open late spring - early summer allowing cars to drive through this end of the campus and drop off without parking. Interior work will begin in the basement of the Institute starting in early April and last until approximately late spring 2019. We do not anticipate that this will cause our neighbors any disruption since this will be interior work. Due to the spring and summer rainy weather, work will be scheduled for most weekends from August 26, 2017 to the end of February, 2018. Typically the work will be on Saturday, but Sunday's are also possible. Please note, the contractor is aware that noisy work cannot commence before 9 am on site and have confirmed they will respect the City by laws. We are also reminding them to be respectful and not smoke and litter in the neighbourhood. Please note that the tower crane removal from the UOHI expansion site is scheduled to take place on Saturday January 21, and Sunday January 22, 2017. Unfavourable weather may require rescheduling of the removal. The removal and dismantling will occur from the east side of the construction site - off Melrose Avenue. Staff, patients, and families should therefore expect a great amount of trucks/flatbeds and equipment coming in and out of the site. The UOHI expansion has been increased to 6 floors (5 above ground) from the originally envisioned 5 story annex to allow for future growth. The Committee of Adjustment is being asked to approve a minor variance in height. Twenty five feet of the additional floor's NW corner was built between 18" and 1 metre taller than zoning permits. Please note, the structure for all 6 floors has been built. No additional height above what can be seen today is being added. We wanted to update you on some current and upcoming work on the Heart Institute's expansion site, and more specifically on the imminent pouring of concrete for the new tower. The completion of each level in the tower will consist of concrete delivery, placement and finishing. Typically, the deliveries and placement will begin around 7:00 a.m. (at the earliest) with the finishing going into the evening and/or early morning hours. As some of you may know, once you start a foundation pour..you must finish it in one session. The actual duration will depend on multiple factors including when the delivery/placement begins, the quantity of concrete being placed, and the weather/temperature as it affects the setting of the concrete and finishing. Concrete trucks will likely be making deliveries from both Melrose Avenue and Ruskin Street, depending on the exact location of the pouring and other activities around the construction site at that time. Below is a projected "slab pour" schedule for Level-1 (ground floor) to Level-6 (penthouse) inclusive. The actual dates (days), noted for each level pour will be confirmed as we get closer to each date. PCL has advised UOHI of their intent to potentially work this weekend, Saturday February 20, from 7 a.m. to 4 p.m. Unfortunately, the weather conditions from earlier this week have prevented them from giving UOHI three days notice. The Heart Institute has requested that any particular noisy work should not begin before 9 a.m.
Work will be done on the UOHI expansion construction site this weekend, on Saturday February 6, from 7 a.m. to 4 p.m. The PCL team will be drilling dowels into the concrete foundation walls in the mass excavation, and/or drilling dowels down the acclimatized link. Site Prep will be working within the mass excavation and around stair H-F backfilling and hauling away material. The Heart Institute has requested that particular noisy work should not begin before 9 a.m.
Work is expected to be done this weekend on Saturday Jan 30, from 7 am to 5 pm. Please be advised that we have received 'tentative' notice that the contractor (PCL) may be working this weekend on Saturday, January 23rd, 2016. The notice is weather dependent - as it will be determined if the 'cold' weather has affected their scheduled construction tasks of this week. As soon as we receive final notice, either way, we will advise all parties accordingly and hopefully a posting will be made on the UOHI Expansion site. Jan 9: There will be noisy work done on Saturday January 9th to remove and demolish the existing concrete parkade slab (former parking garage) at Building J (TOH - Ambulatory Care) including the breaking of concrete. As well, there will be footing preparation to the area of the New Building. Excavation will include some breaking of rock. Jan 11-14: Roadcut to Ruskin Street. Traffic will be one-way for the duration of the work. The contractor will be providing flagmen to monitor and control the traffic flow, including pedestrians. The road cut on Ruskin Street is required so the new site services (sanitary & storm) can be connected to the existing services. Ruskin will be one way for these 2 days while the crews make a road cut on Ruskin Street to connect new fire hydrant to the existing water service. Details in the attached. They have noted that this work will be limited to activities that will not be noisy. Primarily measuring and prepping of protection from the entrance doors & windows, as well minor work on the roof level where the canopy meets the existing building. This preparatory work is necessitated by the scheduled removal and demolition of the existing canopy on Monday and Tuesday, November 23rd & 24th respectively. The Heart Institute held a second Public Information session and provided residents with updates on the expansion construction project. We learned that the timetable for excavation has moved up and will start late Sept/early October and it will last 4-5 mos. The contractor will ensure streets are swept regularly. We learned the route the trucks will take to remove the dirt (empty trucks arrive via Parkdale, Ruskin and Melrose..pickup dirt, then back onto Melrose and out via Carling). The good news is that there will be NO blasting. Concrete is expected to be poured before Christmas and there may be evenings that the pour has to continue into the early evening as once a pour starts, it must complete the same day. to pickup We also learned that because of the new location for the temporary ambulance entry, the east side of Melrose will be made a "No Stopping" zone for approximately 2.5 to 3 years. Here is a copy of the presentation with much more information. As always, you can also check the Heart Institute's expansion website fore more information HERE. 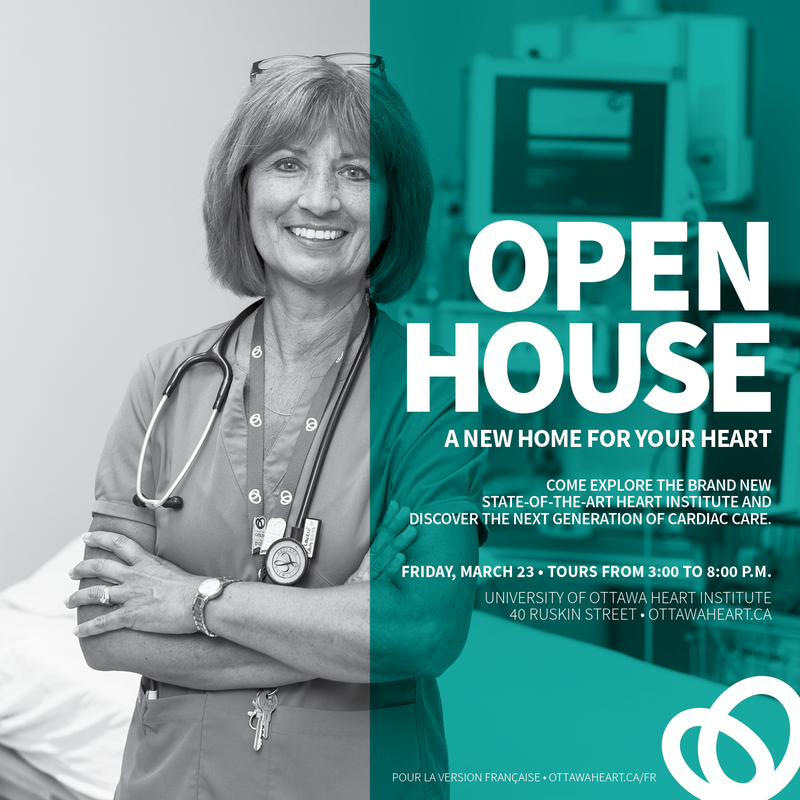 For additional information and questions related to the expansion, you can also contact expansion@ottawaheart.ca. Melrose Avenue will be closed (one way local traffic only will be maintained) on March 31, 2015, to extend a new fire hydrant lead (piping) from the west side of Melrose Avenue to an existing water main located on the east side of Melrose Avenue. The complete road cut and reinstatement of road will be in conformance with permits issued by the City. During only a short period of time, at both the commencement of the excavation and completion of the backfilling of the road cut, traffic will be closed in both directions locally at the road cut. At all times, residents will have unimpeded access to their respective laneways. Also, please note, that a portion of the existing west side of the Melrose Avenue sidewalk will be closed between March 30, 2015 and April 9, 2015. This is to allow for the removal of the existing sidewalk and replacement with a new depressed concrete curb/sidewalk. The Heart Institute will be undertaking some minor work relative to the final completion of the MRI installation project starting March 20th. The work will be internal to the building so they expect there will be minimal impact outside of the Heart Institute. They will, however, need to provide contractor access to the MRI from the entrance on Melrose (the temporary "blue" door) to avoid contractors walking through sterile Operating Room and ICU areas. There will be some supplies delivered, but the main use of the door will be for the contractor to enter/exit the building. The first part of the project will occur between March 20th and April 2nd. There will be weekend work. The second part of the project will occur across two weekends as it involves shutting down the power to some of our procedure rooms. We are anticipating the work to happen April 10 - 12 and April 17 - 19. Once all of the work is complete, the original glass door on the east side of the building will be reinstated. On Jan 13, 2015, The University of Ottawa Heart Institute held a Public Information Meeting regarding the upcoming Heart Institute Expansion construction project. Over 50 residents attended. The Heart Institute had on hand their project lead as well as a representative from the construction firm, Jeff Leiper-our City Councillor and Yasir Naqvi -our Ottawa Centre MPP . The meeting reviewed the project, timelines, local impacts and provided responses to our questions. ﻿ Minutes from the meeting can be found HERE. Here is a picture of the project timelines as well as a brief summary of upcoming construction with respect to Melrose Avenue for Phase 1 of the expansion project, for the period of January 2015 to May 2015 inclusive. This summer, the Ottawa Heart Institute is installing a new Cardiac MRI, the first in the Region. Unfortunately that will mean some inconveniences for nearby residents. In late April a generator and a garbage bin were established in two small fenced in areas near the Melrose ambulance entrance. The contractor will be restoring the greenspace back to its original condition once the project is completed. On May 28th, construction plans were modified as the demolition work was interrupting surgery. Unfortunately, that means that some of this very loud work must now happen on the weekend, impacting local residents even further. Residents and CHNA have brought forward our concerns regarding noise as well as the abuse of the landscaping by both equipment and the continued parking by contractors on greenspaces and the littering habitually seen by staff. Attached is the response provided by the Heart Institute providing more details on what is being done, why, and what we can expect going forward. As much as possible, the contractor is to make deliveries to the Ruskin Avenue loading dock entrance prior to 7:00 am and none of these pre-7:00 am deliveries will use Melrose Avenue for access. Any deliveries that must use Melrose will be made during regular business hours. Concrete will be poured this Monday, July 21, starting at 7 a.m. Unloading will be done from the ambulance entrance. There will be 3 trucks used, on a staggered schedule. A truck may be parked on Melrose for a short time while it waits it's turn to unload. The City intends to approve a lay-by (ie a road widening) on the south side of Ruskin, West of Melrose. The intent is to provide a patient drop off zone for the Heart Institute as part of their expansion. Attached is a picture of the current proposal as well as the link to the city's notice.